If printing this education material, we suggest you also print the relevant linked pages from the prizes database. Have you ever painted with watercolours? GW Bot has used watercolours to paint these three trees. She has simplified their shapes so we only see their trunks and branches twisting against a pale blue sky. The artist calls the trees glyphs – a word that is used to describe a carved or specially shaped symbol that can represent something else. For Bot, the trees represent nature and life. How would you change these trees to make them look livelier? List words to describe these organic forms. How has the artist suggested growth and energy? Why do you think she has included the circular moon in the corner? Do you see the circular shape repeated? Reflect on the title of the work. What does the word 'homage’ mean? View Rembrandt’s etching The three trees 1643 in the Gallery’s collection and compare it to Bot’s watercolour. Discuss the similarities and differences. After viewing both images sketch your own interpretation of the tress of life. Have you ever stood at the foot of a tree and looked up into its branches? Fan Dongwang has placed us at the foot of these colourful trees and encourages us to think differently about how we look at the world around us, taking time to enjoy the splendour of nature. He has used bold colours to show the shape and pattern of the tree trunks so they appear to be carved. Notice how they are silhouetted against the sky, making us feel very small in comparison. How does the artist suggest the majestic nature of these gum trees? How has he created an alternative representation of the Australian bush? List the colours you can see. Do these colours suggest a time of the day? Explain your response. Can you tell what part of this painting is sky and what is ocean? Michael Johnson has painted an abstract view of the sky and clouds using blocks of colour and bold shapes. A diagonal line of light divides the painting so our viewpoint is changed from the usual way of seeing a horizon line running straight across the canvas. Do you think Michael has included any land? What is your overall impression of this work? How would you describe the mood of this painting? Discuss the impact of the diagonal and horizontal bands that divide the composition. Find out about the term 'Oceani’. How does it relate to Australia? Read the accompanying label text in the prizes database and look again at the painting with this knowledge. Discuss what you think the artist is exploring. Have you ever experimented with paint? The artist Ildiko Kovacs has used swirls of paint to make ribbon-like shapes that are based on her memories of walking along the coastline near Bundeena. She has used rollers to apply the paint and you can see where she has scraped the paint back to reveal the colours underneath. Different shades of green contrast with red and lilac to give the illusion of depth. Move your body in time to the rhythm and shapes of this landscape. What do you associate with the colour green? The artist is referencing the experience of walking through the bush. If the colour of the background was changed to red or blue, how would it affect your reading of the painting? Locate the areas where the artist has used a roller or scraped back the surface to reveal the under-painting. Imagine the physical act of creating this painting. Do you like to sit and watch the world go by? Noel McKenna did just that when he visited some of his friends at Palm Beach. This painting shows the different activities he saw around the wharf there. Noel has used a cartoon-like composition to show all the scenes at once so our eyes move around the canvas taking in all the details. Thin washes of paint and drips suggest how fleeting each moment can be. What different activities can you spot? Identify the various views of Palm Beach. How has McKenna treated each of these views? Which have been repeated? Imagine what it would be like to visit Palm Beach wharf. How would you spend a day there? Draw a picture of yourself visiting this place, in McKenna’s style. What do you love about the place where you live? This painting by Michael Muir is based on his memories of living near the sea. Michael has used simple shapes and bright colours to show houses, buildings and trees. The street is brightly lit by the sun and there is very little detail, so we can use our imagination to make up what is happening. What secrets could this street hold? How does the placement of the figure in the bottom right of the composition impact on your reading of this painting? 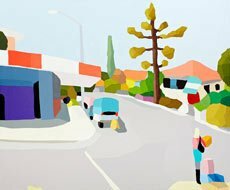 Construct a story based on what you see in this suburban Australian scene. How do you think the solid blocks of colour have been applied? What is your response to this use of bold, flat colour? Have you ever been bush walking and noticed the plants and landscape around you? This painting depicts a part of Western Australia that a group of women travelled through in ancestral times. The artist, Yinarupa Nangala, has included designs that represent the bush food they gathered on their journey and she has used earthy colours to create rhythm and pattern. Which patterns do you think could be the desert raisins and bush tomatoes? Describe this painting in terms of composition, shape and colour. Discuss the effect of the repetition of shapes and patterns. What do you notice about this work when viewed from the different vantage points, including at a distance and close up? Look for clues to suggest how the paint was applied to the surface of the canvas. Can you spot what is painted and what is collaged in this large artwork? The artist, John Webb, has combined painting techniques with intricate paper-cut collage to create an imagined scene that combines nature and industrial architecture. John has played with the scale and composition of the scene so it appears as if we are seeing things straight on and from above all at the same time. How many animals and birds can you spot? Describe what you see in this artwork. Identify the man-made and organic forms. How does the orange add to the harmony within the work? Imagine the techniques and processes the artist used to create this work. In your opinion, what makes this work unique in this year’s Wynne Prize?